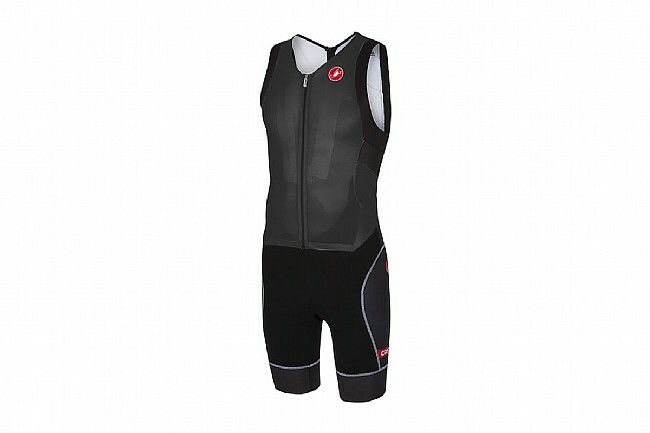 Slip into the Free Sanremo Sleeveless suit from Castelli and slice through the wind on your way to victory. This slick one-piece suit slides underneath your wetsuit, or wear it standalone to speed through T1. Designed to perform, the Sanremo is constructed from SpeedFreak fabric up top and Instadry Speed fabric down below for a form-fitting garment that speed through wind and water alike while drying nearly by the time you're on the bike. Once dry, the Velocity mesh back panel will keep you cool and comfortable, aided by the full-length zipper up front. Castelli has made quite a name for themselves with their aerodynamically optimized apparel, and the Sanremo boasts a whopping 9 watt savings at 40 km/h thanks to the mix of elbow-length sleeves and the technical fabrics. 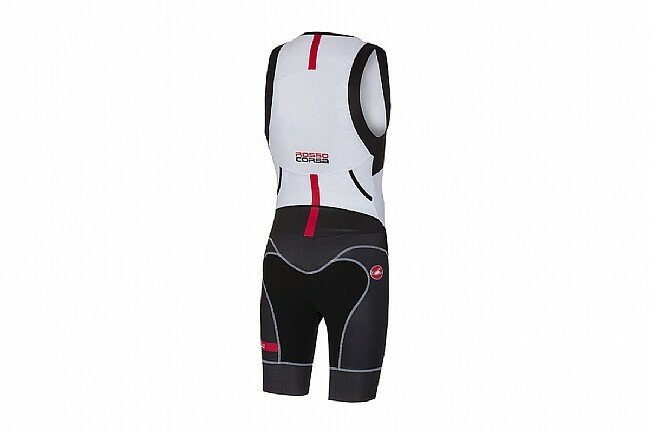 While Castelli is a historic cycling brand, this suit definitely doesn't slack on the run. Flatlock seams and the lightly padded tri-specific KISS Tri chamois reduce chafing and discomfort during the run, while still being capable of supporting you through that ultra-long bike leg. Angled FreeAero 2 pockets at the back provide easy access to nutrition during the bike or run while keeping everything safely stowed away. FreeAero 2 hydro- and aero-optimized rear pockets. Dual hip pockets offer easy access to nutrition during run. KISS Tri Seat Pad is comfortable on the bike and disappears on the run. Claimed weight: 182 grams (large).